The Dark Blues won their first points of the season with a hugely significant 2-0 win at Hamilton. Andy Boyle put the Dee ahead late in the first half and Kharl Madianga made the points safe when he shot home in front of the delighted travelling support deep into injury time. The Dee rode their luck at times in the second half, when Accies struck the woodwork twice, but they were by far the better team over the whole game and should have secured the win long before the end. Paul McGowan dropped out through injury, and Lewis Spence replaced him. That was the Dee’s only change from last week. Accies made two changes. Tom Taiwo and Sam Kelly came in for Darian Mackinnon and Mikel Miller. 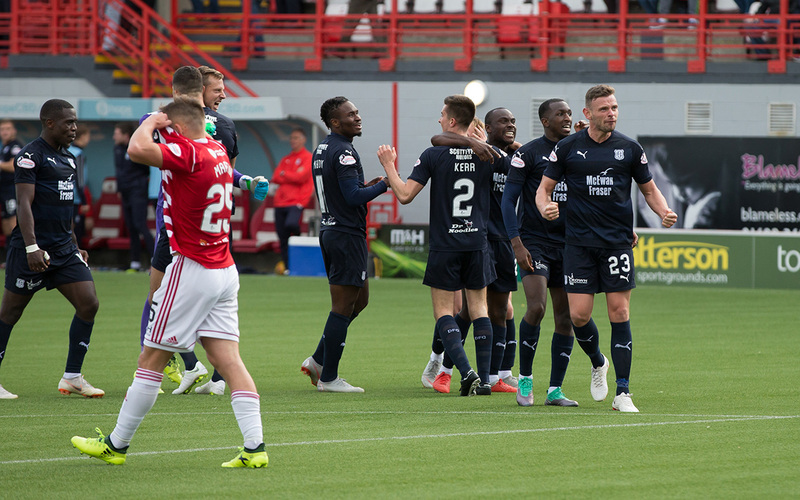 Dundee needed to start well, and if there were no fireworks the Dark Blues did settle into the game much better than their hosts. Most of the play was in Accies’ half with the home side struggling to get near Elliott Parish’ goal in the first half. It took 14 minutes for the first serious shot when Lewis Spence pinged a 20 yarder a couple of feet wide. Hamilton had a few free kicks 30 to 40 yards out, but failed to worry Dundee with them. Dougie Imrie had Accies’ only shot of the fist half when he ran onto an angled ball and fired high and wide, but that was barely even a half chance. Dundee gradually turned midfield control into real pressure on the Accies rearguard. Benjamin Källman ran onto a flick by Adil Nabi, but Aaron McGowan blocked his shot. Nabi then found space in the penalty area but couldn’t get a shot in. Källman couldn’t quite reach a dangerous low cross by Elton Ngwatala right in front of goal. Calvin Miller was causing Hamilton problems with his running down the left and he was scythed down only a foot outside the penalty area, but Nabi’s free kick struck a defender. The Dark Blues finally took a deserved lead from another free kick just outside the box, on the right. Miller curled the ball to the far post where Andy BOYLE rose to score with a firm header after 37 minutes. Instead of goading the home side into action the goal gave Dundee new confidence and the rest of the first half was spent in the Accies half with the Dee pushing for a second goal. The second half opened with Dundee still on top and looking likely to score a second goal that would have been decisive against a Hamilton team what were off form and misfiring. Ryan Inniss should have scored that second goal when a well worked short corner gave him a chance eight yards out, but Gary Woods made a superb instinctive save on the goal line from his low shot. Hamilton gambled by taking off two midfielders and sending on two strikers, Bingham and Keatings replacing Taiwo and Kelly. Within a couple of minutes Bingham went close with a 35 yard free kick. Accies were bypassing the midfield and starting to give Dundee’s problems by hitting long balls for the strikers to chase and battle for. It was Dundee who had the next chance when Scott McMann bizarrely sent a throw in straight to Källman in Accies’ own half. Källman found Nabi and with the two Dees facing only one defender Nabi chose to shoot instead of playing Källman in on goal and fired wastefully over the bar. Hamilton now had their best and most dangerous spell of the match. Boyd missed from 15 yards when Parish didn’t get enough on a punch. Brustad stabbed a close range shot wide after Bingham found space on the left. Boyd then hit the crossbar with a 20 yard free kick. Dundee weathered that five minute storm and for the next 15 minutes until the end of regulation time managed to largely control the game and keep Accies at bay. However, after 2 minutes of injury time Hamilton again struck the crossbar. Bloomfield’s header from Boyd’s free kick looped onto the bar almost in slow motion and Dundee managed to clear. Jean Alassane Mendy had replaced Nabi and he had the chance to break clear, but chose to play safe and doubled back looking for support to make sure the Dee kept the ball. Dundee played it around in Accies’ half till substitute Roarie Deacon turned his marker on the right. He broke clear into the penalty area and cut the ball back for Kamara to touch it into the path of Kharl MADIANGA, who thrashed his shot high into the net from eight yards and sent the Dees behind that goal bouncing around in jubilation. There was barely time to restart the match and the Dark Blues had notched up their first league win of the season. Hamilton is always a tough ground to visit and a 2-0 win is always very welcome. After the Dee’s horrendous start to the season the three points, two goals and a much prized clean sheet were all tremendously welcome. This was a performance that had plenty of heart and confidence. 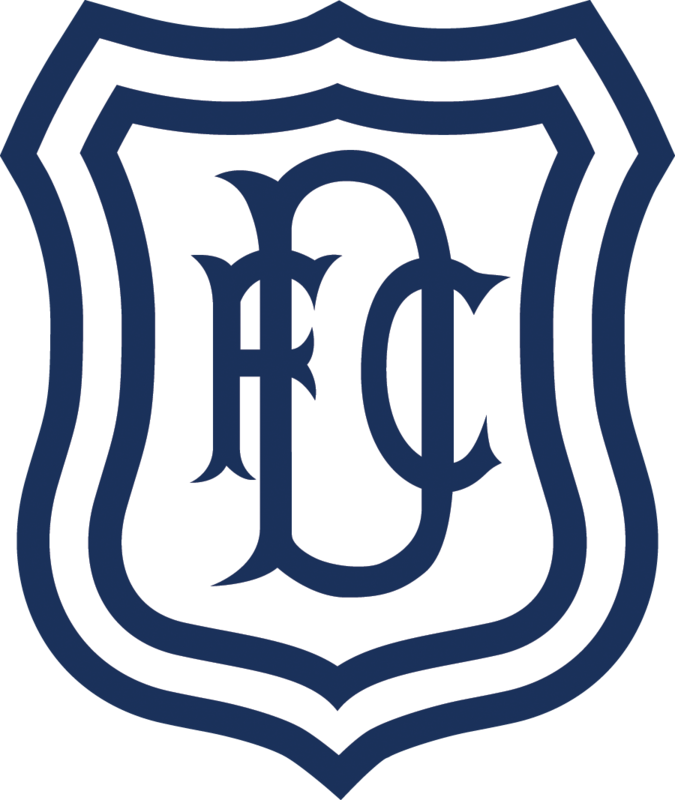 Dundee were the side who played the better football all through the match and it was marvellous to see the players get the reward they deserved. Unused subs: Fulton (gk), Gordon, Tshiembe, Sowah. Booked: Imrie (foul on Spence), Brustad (foul on Inniss). Unused subs: Hamilton (gk), O’Dea, Curran, Henvey, Lambert. Goals: Boyle (37), Madianga (90+3). Booked: Boyle (foul on Brustad), Ngwgatala (foul on Want), Brustad (foul on Inniss). Referee: Willie Collum. Assistants: ndrew McWilliam, John McCrossan. Fourth Official: David Lowe.